Why can’t everyone think with numbers? What cognitive processes do some have that others do not? Some individuals easily understand the concepts underlying math processes. They quickly perform math calculations, mentally or on paper, and have an innate sense of whether or not an answer is correct. But for others math is an illogical enemy, filled with random memorization. For those who “get math,” the language of numbers turns into imagery and they “see” mathematical relationships. They use an internal language, with imagery, that lets them calculate and verify mathematics, and see its logic. 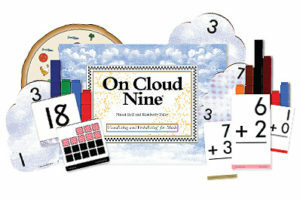 Here are some tips from the On Cloud Nine math program that you can use to help students solve word problems, from simple addition and subtraction to more advanced processes. Read or listen to the whole problem: Students read the problem from beginning to end, to know where the problem is heading. If they start solving the problem too soon, they may have an answer, but not the one the problem requests. Visualize and verbalize the gestalt: Students consciously create images to match the words, then verbalize their imagery. The images are created for the gestalt of the main points of the passage, and should be just enough to match without extra detail. List what needs to be known: Students list the question(s) the problem asks on the right side of the paper. State the problem in sentence form: Students state the problem in their own words, orally or in writing. Convert the sentence to numbers and solve: Students cross out the words as they convert them to numbers presented from the problem. This calls attention to which words turn into which function. For example, the words “more” and “joined” turn into addition when converted to an equation. Verify that all parts of “Need to Know” were answered: Students cross out on the right side of the paper each item they have answered. On Cloud Nine, or any math program, may reach a plateau of effectiveness if students have weakness in concept imagery. Therefore, some students may need to first develop imagery and language processing with the Visualizing and Verbalizing program before they apply concept imagery to mathematical computation. Nanci Bell is the Co-Author of “On Cloud Nine” and the Co-Founder and Director of Lindamood-Bell Learning Processes.